Scrupulous brushing and flossing, along with professional cleanings twice per year, are essential to keeping your teeth healthy and white. However, some foods and drinks are likely to cause staining no matter how good your oral hygiene is. Here are some of the most notorious items for tooth discoloration. They may be filled with antioxidants and other health benefits, but dark berries are also known for their ability to stain the teeth. Blackberries, blueberries, cranberries, and raspberries are particularly prone to staining. Don’t stop enjoying them, but do take active steps to protect your teeth. Drink water with them and right after consuming them to rinse your mouth, and then follow it up with some milk or cheese to neutralize the acids. Bright red tomatoes are a beautiful addition to almost any plate, but they are high in acids that can erode the tooth enamel, exposing the yellowish dentin. Dark green vegetables such as kale and spinach protect the teeth, so always enjoy a salad before a big bowl of pasta with tomato sauce. Citrus fruits can cause the same problems that tomatoes cause, so rinse your mouth completely with plain water after eating them. 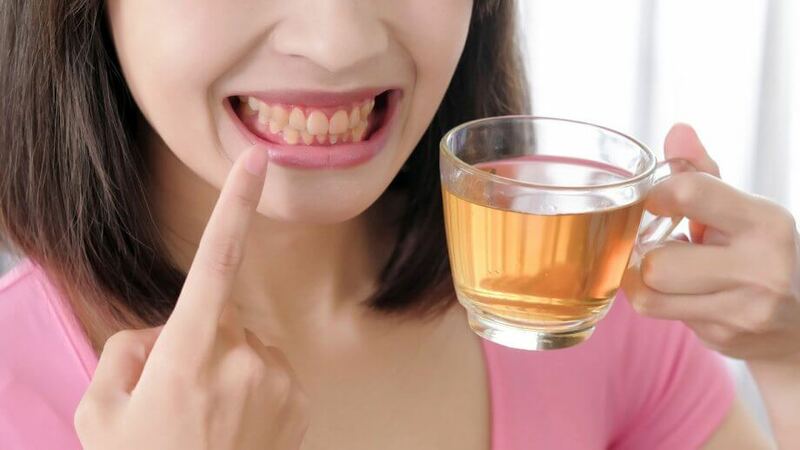 Coffee and tea are notorious for staining teeth thanks to their high concentrations of tannins. You don’t need to give them up, but be proactive about guarding your teeth. Dairy is a natural tooth cleanser, so put a splash of milk in your drink. Also consider drinking from a cup with a lid, which prevents the liquid from coating your teeth. Most people are aware of the tooth staining properties of red wine, but white wine can also darken your teeth. The tannins in red wine cause the same staining as coffee and tea, while the acids in white wine can erode tooth enamel like tomatoes and citrus fruits. Alternate each glass of wine with a glass of water to rinse your mouth. This beloved Indian spice can cause yellowing over time. When eating curry, pair it with such natural tooth cleansers as celery, carrots, cauliflower, or even apples. Dark and sticky balsamic vinegar is a common base for vinaigrette dressings, but it is also prone to causing tooth stains. Fortunately, crunchy vegetables can keep balsamic vinegar from clinging to your teeth. Use a light hand when dressing your salad rather than saturating it, and make sure to include a variety of lettuces and vegetables rather than simple iceberg. You do not need to give up your favorite foods and beverages simply due to the risk of staining your teeth. Instead, practice moderation and balance. Pair stain-causing items with natural cleansers. Rinse thoroughly after eating or drinking. Practice scrupulous brushing and flossing, and have your teeth professionally cleaned twice per year. With a bit of proactive effort, you can minimize the amount of staining caused by the things you consume.